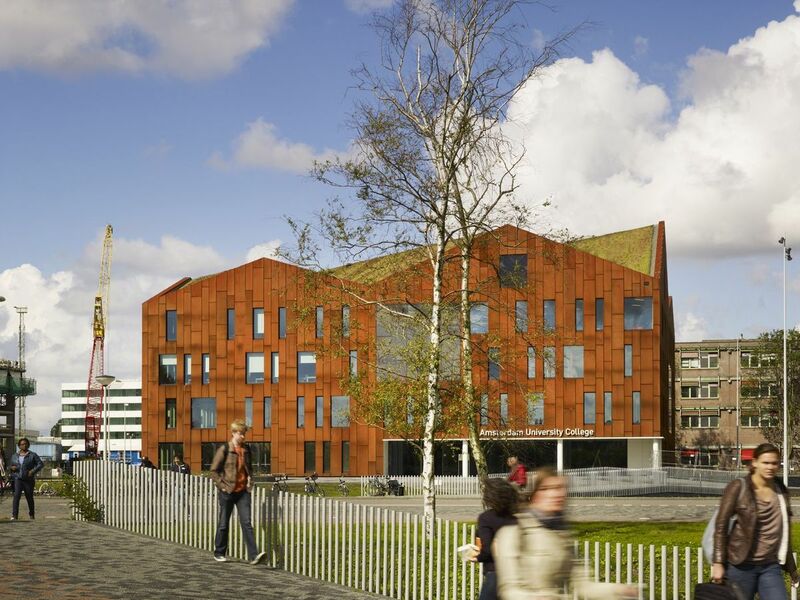 Science Park Amsterdam, the international knowledge centre in the Watergraafsmeer neighborhood is the new home for the Liberal Arts and Sciences program at the Amsterdam University College, a joint institute of the University of Amsterdam and VU University Amsterdam. Science Park is located in the eastern part of the city, close to Amsterdam’s historic seventeenth-century city centre. In September 2012, international students and professors started at the new school of 5,800 m², that can accommodate 900 students. Surrounded by other science buildings, the Science Park provides an interesting environment for the AUC with optimal opportunities for cross fertilization of ideas and talent. The park has an urban character in which buildings, landscape and public space are strongly intertwined. Science Park encompasses a program of 500,000 m² in total including office buildings, laboratories and educational facilities, hotel, conference facilities, sports and cultural programs, restaurants and housing. Click here for more photos of the project on Archinect.